This story was co-published with NPR, the Boston Globe and the Tampa Bay Times. Doctors have long disputed that the payments they receive from pharmaceutical companies have any relationship to how they prescribe drugs. There’s been little evidence to settle the matter — until now. A ProPublica analysis has found for the first time that doctors who receive payments from the medical industry do indeed tend to prescribe drugs differently than their colleagues who don’t. And the more money they receive, on average, the more brand-name medications they prescribe. Doctors who got money from drug and device makers—even just a meal– prescribed a higher percentage of brand-name drugs overall than doctors who didn’t, our analysis showed. Indeed, doctors who received industry payments were two to three times as likely to prescribe brand-name drugs at exceptionally high rates as others in their specialty. Doctors who received more than $5,000 from companies in 2014 typically had the highest brand-name prescribing percentages. Among internists who received no payments, for example, the average brand-name prescribing rate was about 20 percent, compared to about 30 percent for those who received more than $5,000. ProPublica’s analysis doesn’t prove industry payments sway doctors to prescribe particular drugs, or even a particular company’s drugs. Rather, it shows that payments are associated with an approach to prescribing that, writ large, benefits drug companies’ bottom line. See how industry dollars reach your doctors.Explore the app. Numerous studies show that generics, which must meet rigid Food and Drug Administration standards, work as well as name brands for most patients. Brand-name drugs typically cost more than generics and are more heavily advertised. Although some medications do not have exact generic versions, there usually is a similar one in the same category. In addition, when it comes to patient satisfaction, there isn’t much difference between brands and generics, according to data collected by the website Iodine, which is building a repository of user reviews on drugs. There’s wide variation from state to state when it comes to the proportion of prescribers who take industry money, our analysis found. The rate in Nevada, Alabama, Kentucky and South Carolina was twice as high as in Vermont, Minnesota, Wisconsin and Maine. But overall, payments are widespread. Nationwide, nearly nine in 10 cardiologists who wrote at least 1,000 prescriptions for Medicare patients received payments from a drug or device company in 2014, while seven in 10 internists and family practitioners did. The results make sense, said Dr. Richard Baron, president and chief executive of the American Board of Internal Medicine. Doctors nowadays almost have to go out of their way to avoid taking payments from companies, according to Baron. And those who do probably have greater skepticism about the value of brand-name medications. Conversely, doctors have to work to cultivate deep ties with companies—those worth more than $5,000 a year — and such doctors probably have a greater receptiveness to brand-name drugs, he said. ProPublica analyzed the prescribing patterns of doctors who wrote at least 1,000 prescriptions in Medicare’s drug program, known as Part D. Across five common specialties, as doctors received more money, they tended to prescribe a higher percentage of brand-name drugs. Note: ProPublica calculated brand-name prescribing rates for doctors who received no payments, $0.01 to $100, $100 to $500, $500 to $1,000, $1,000 to $5,000 and more than $5000 in payments from drug or device companies in 2014. Physicians consider many factors when choosing which medications to prescribe. Some treat patients for whom few generics are available. A case in point is doctors who care for patients with HIV/AIDS. Others specialize in patients with complicated conditions who have tried generic drugs without success. Holly Campbell, a spokeswoman for the Pharmaceutical Research and Manufacturers of America, the industry trade group, said in a statement that many factors affect doctors’ prescribing decisions. A 2011 survey commissioned by the industry found that more than nine in 10 physicians felt that a “great deal of their prescribing was influenced by their clinical knowledge and experience,” Campbell said in a written statement. Several doctors who received large payments from industry and had above-average prescribing rates of brand-name drugs said they are acting in patients’ best interest. Get the data that powers this investigation. A complete, digital download is available for purchase in the Data Store. Dr. Felix Tarm, of Wichita, Kansas, likewise prescribed more than twice the rate of brand-name drugs than internal medicine doctors nationally. Tarm, who is in his 70s, said he’s on the verge of retiring and doesn’t draw a salary from his medical practice, instead subsidizing it with the money he receives from drug companies. He said he doesn’t own a pharmacy, a laboratory or an X-ray machine, all ways in which other doctors increase their incomes. 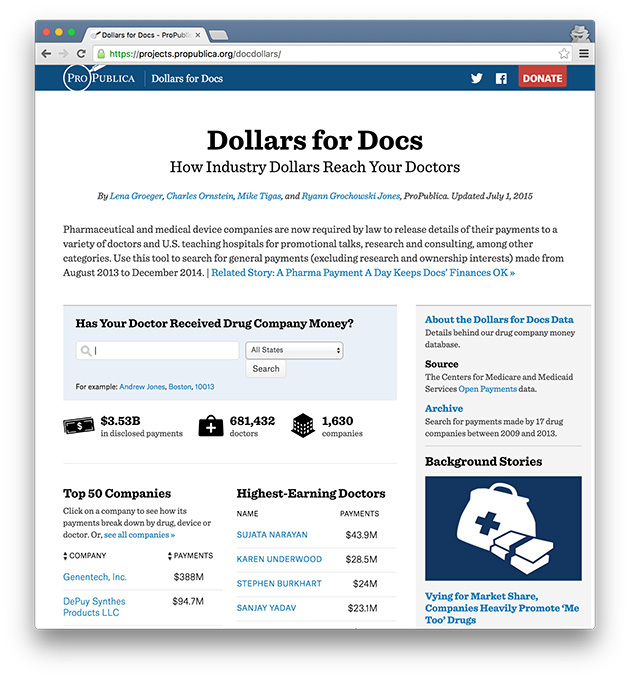 ProPublica has been tracking drug company payments to doctors since 2010 through a project known as Dollars for Docs. Our first lookup tool included only seven companies, most of which were required to report their payments publicly as a condition of legal settlements. The tool now covers every drug and device company, thanks to the Physician Payment Sunshine Act, a part of the 2010 Affordable Care Act. The law required all drug and device companies to publicly report their payments. The first reports became public in 2014, covering the last five months of 2013; 2014 payments were released last year. The payments in our analysis include promotional speaking, consulting, business travel, meals, royalties and gifts, among others. We did not include research payments, although those are reported in the government’s database of industry spending, which it calls Open Payments. Separately, ProPublica has tracked patterns in Medicare’s prescription drug program, known as Part D, which covers more than 39 million people. Medicare pays for at least one in four prescriptions dispensed in the country. Nationally, about three quarters of doctors across five common medical specialties received at least one payment from a company in 2014. In Nevada, that number was over 90 percent. In Vermont, it was less than 24 percent. Note: The five specialties are family medicine, internal medicine, cardiovascular disease, psychiatry and ophthalmology. This analysis matches the two datasets, looking at doctors in five large medical specialties: family medicine, internal medicine, cardiology, psychiatry and ophthalmology. We only looked at doctors who wrote at least 1,000 prescriptions in Medicare Part D.
Sen. Charles Grassley, R-Iowa, who pushed for the Physician Payment Sunshine Act, said in a statement that “it’s gratifying to see” ProPublica’s analysis. Dr. David W. Parke II, chief executive of the American Academy of Ophthalmology, suggested that many payments made to ophthalmologists don’t relate to drugs they prescribe in Medicare Part D, and instead may be related to drugs administered in doctors’ offices or devices and implants used in eye procedures. As a result, he said, it may be unfair to presume that industry payments are associated with prescribing in Part D.
Dr. Kim Allan Williams Sr., president of the American College of Cardiology, said he believes relationships between companies and doctors are circular. The more physicians learn about a new drug’s “differentiating characteristics,” he said, the more likely they are to prescribe it. And the more they prescribe it, the more likely they are to be selected as speakers and consultants for the company. “That dovetails with improving your practice, and yes, you are getting paid to do it,” he said. Williams said new drugs are, at least in part, responsible for a significant decrease in cardiovascular mortality in the past three decades.